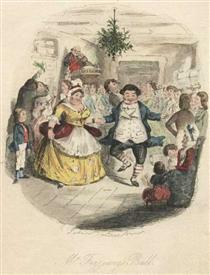 John Leech (29 August 1817 – 29 October 1864 in London) was an English caricaturist and illustrator. He is best known for his work for Punch, a humorous magazine for a broad middle-class audience, combining verbal and graphic political satire with light social comedy. Leech catered to contemporary prejudices, such as anti-Americanism and antisemitism and supported acceptable social reforms. Leech's critical yet humorous cartoons on the Crimean War help shape public attitudes toward heroism, warfare, and Britons' role in the world. 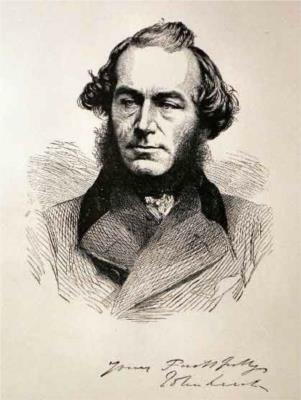 John Leech was born in London. His father, a native of Ireland, was the landlord of the London Coffee House on Ludgate Hill, "a man", on the testimony of those who knew him, "of fine culture, a profound Shakespearian, and a thorough gentleman." His mother was descended from the family of Richard Bentley. It was from his father that Leech inherited his skill with the pencil, which he began to use at a very early age. When he was only three, he was discovered by John Flaxman, who was visiting, seated on his mother's knee, drawing with much gravity. The sculptor admired his sketch, adding, "Do not let him be cramped with lessons in drawing; let his genius follow its own bent; he will astonish the world"—advice which was followed. A mail-coach, done when he was six years old, is already full of surprising vigour and variety in its galloping horses. Leech was educated at Charterhouse School, where William Makepeace Thackeray, his lifelong friend, was a fellow pupil, and at sixteen he began to study for the medical profession at St Bartholomew's Hospital, where he won praise for the accuracy and beauty of his anatomical drawings. 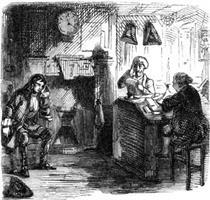 He was then placed under a Mr Whittle, an eccentric practitioner, the original of "Rawkins" in Albert Smith's Adventures of Mr Ledbury, and afterwards under Dr John Cockle; but gradually he drifted into the artistic profession. His nickname also being "Blicky" stuck with him during his life, along with being famous. He was eighteen when his first designs were published, a quarto of four pages, entitled Etchings and Sketchings by A. Pen, Esq., comic character studies from the London streets. 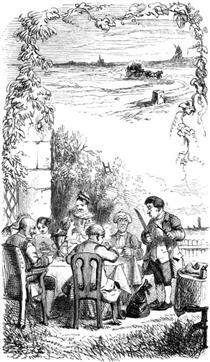 Then he drew some political lithographs, did rough sketches for Bell's Life, produced a popular parody on Mulready's postal envelope, and, on the death of Dickens illustrator Robert Seymour in 1836, unsuccessfully submitted his renderings to illustrate the Pickwick Papers. 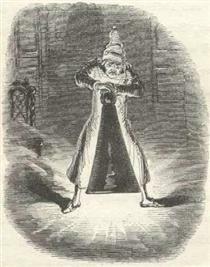 In 1840 Leech began his contributions to the magazines with a series of etchings in Bentley's Miscellany, where George Cruikshank had published his plates to Jack Sheppard and Oliver Twist, and was illustrating Guy Fawkes in feebler fashion. In company with the elder master Leech designed for the Ingoldsby Legends and Stanley Thorn, and until 1847 produced many independent series of etchings. These were not his best work; their technique is imperfect and we never feel that they express the artist's individuality, the Richard Savage plates, for instance, being strongly reminiscent of Cruikshank, and The Dance at Stamford Hall of Hablot Browne. In 1845 Leech illustrated St Giles and St James in Douglas William Jerrold's new Shilling Magazine, with plates more vigorous and accomplished than those in Bentley, but it is in subjects of a somewhat later date, and especially in those lightly etched and meant to be printed with colour, that we see the artist's best powers with the needle and acid. Appius Claudius Punished by the People John Leech ? Cicero denouncing Catiline John Leech ? Flaminius Restoring Liberty to Greece at the Isthmian Games John Leech ? Marius discovered in the Marshes at Minturnæ John Leech ? The Mother of the Gracchi John Leech ? Ghosts of Departed Usurers John Leech ? Ignorance and Want John Leech ? 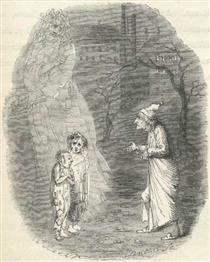 Marley’s Ghost John Leech ? 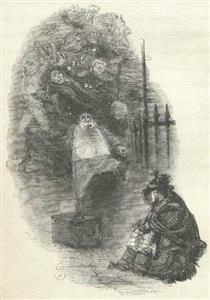 Mr. Fezziwig’s Ball John Leech ? 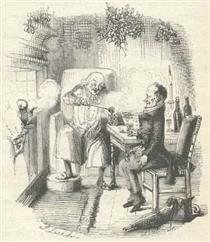 Scrooge and Bob Cratchit John Leech ? 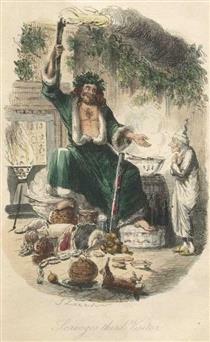 Scrooge Extinguishes the First of Three Spirits John Leech ? 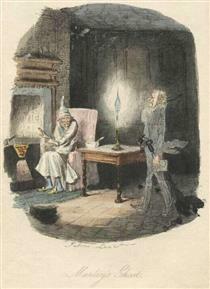 Scrooge’s Third Visitor John Leech ? 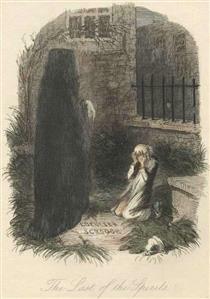 The Last of the Spirits John Leech ? A Curious Finish John Leech ? Head and Hands will beat Heels John Leech ? Hold Har-r-r-d! John Leech ? The Meet John Leech ? Snitchey and Craggs John Leech ? The Night of the Return John Leech ? The Parting Breakfast John Leech ?